"Double Negative" by Pamela Towns. 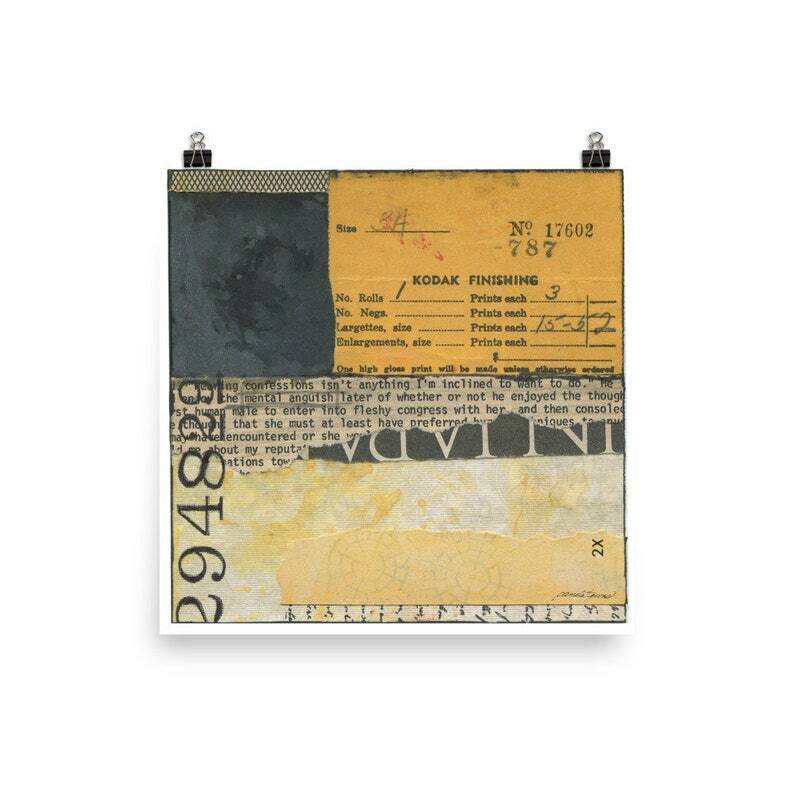 This listing is for a digital art print of the original mixed-media abstract collage made with found papers, ink and paint. A statement in any room. These matte, museum-quality posters are printed on durable, archival paper. Ready to frame and available in multiple sizes. The artwork offered here is for personal use only. All copyright and reproduction rights remain with the artist and shop owner, Pamela R. Towns. The artwork may not be reproduced by any means whatsoever without the expressed written permission of the artist. With nearly 30 years as a graphic designer, I love the art of combining images, typography, colors and textures. As a collage artist, I use old papers, ephemera, letter forms, textures, art papers, colors and graphics as my media to produce creative layouts. I draw inspiration from unique graphics, interesting textures, words, histories, patterns and letters found while hunting through the aisles of antique stores and the garage and basements at estate sales. Those found items—from old books to rusty metal pieces—work to stimulate ideas for the pieces I create. Acting purely on intuition and experimentation, I move unrelated pieces around on the page until an aesthetically pleasing arrangement emerges.